Welcome aboard! Let Captain Lloyd Daume take you on a 1 to 4 person fishing adventure this season. Whether it's a Lake Ontario salmon charter or Bay of Quinte walleye fishing, you've come to the right place. 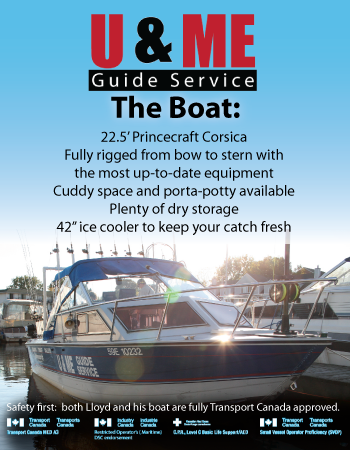 Both Lloyd and his vessel are Transport Canada approved.- learn more about the boat, here! With this added safety feature, along with over 40 years of fishing experience, Lloyd knows how to give you a great charter experience on Lake Ontario and the Bay of Quinte. As an added bonus, he will clean and package your catch for you at the end of the day! We promote catch and release, but respect if our clients wish to keep their legal limits. Choose your adventure, and let the fishing charter begin! FISH GUARANTEE: Captain Lloyd guarantees to give his 100% to find your fish!